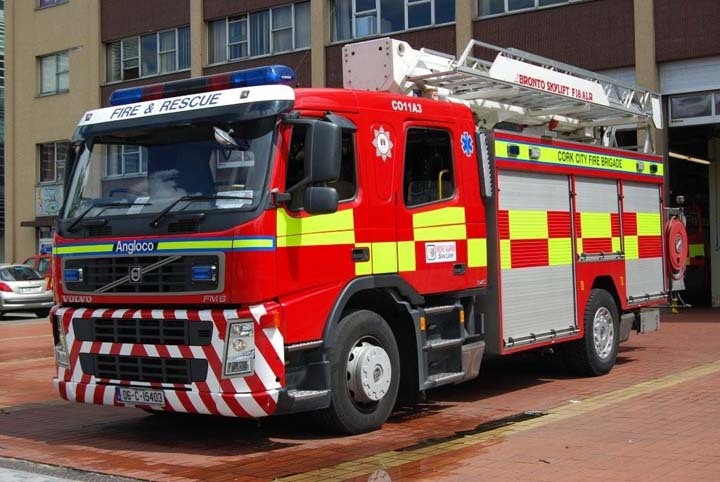 The Cork City Fire Brigade have two Bronto Sklift aerial ladder platforms in its front-line fleet. This Volvo FM9/Angloco "combined aerial rescue platform" is fitted with a Bronto F18ALR boom. How is it that everyone is slating Volvo ALP Machines in Central Scotland and Scanias in Strathclyde, yet I don't see reports of problems with Irelands machines. Do they know something everyone else doesn't. I'm don't work in a Fire and Rescue Service but am intrigued why some machines work but similar ones don't?? Added by Nigel Everett on 07 September 2008. It is mostly down to the fact that the Irish Machines have 18 meter booms and are used in addition to dedicated ALP/TL/HP appliances, the Central and Strathclyde ARP have 30 meter booms and are being used to replace 2 appliances as a cost cutting measures. Added by Stuart on 09 September 2008. Right, so basically these have mechanical ladders which supplement ALP's but not replace them, but in Scotland they are trying to get the best of both worlds, which saves money but puts firefighters at risk. We have had similar problems with Police fleet buyers getting the best deals rather than the most appropriate cars. Added by 999Enthusiast on 09 September 2008. Added by Rich(larbert fire cadets) on 25 October 2008. Added by Barrie Green on 25 October 2008. I totally agree with you Barrie. Added by Ian Moore on 26 October 2008. You are right of course Barrie, Rich, the mass of the Irish machines booms and gear is not as heavy and high as the Carps therefore the handling should be safer although you wouldn't see me dead in one of these. If you study other pictures on this site you will notice how, compared to older designs, these machines are top heavy. That's fine for a commercial vehicle but not an emergency one. No, Barrie and others are right, these machines are about saving money, not lives. I would also rate the Volvo chassis as safer than the Scania. Added by John Stott on 26 October 2008. Dear friends, the Irish machines have caused problems, with defects in operation, control levers breaking, high centre of gravity makes them a "bit" unstable when mobile to incidents, but the reality is they are not used as often in anger as their UK counterparts so the big problems don't show up so easily. PS the old Simon snorkel were in general trouble free.The Cork machine froze in the air with the CFO, the Government Minister and the Photographer on it handover day.I'm told they were rescued by the older HP. Added by Wally on 10 January 2009. Thanks Wally, I cried laughing at the thought of a CFO "up top"! As for the design, enough has been said on that, lets just hope the lads stay safe on it! Added by John Stott on 11 January 2009.
wonder how long they will last then if the 'firey' was caught out on one of these?. i was just about wetting myself thinking about this and the conversation between the 'firey' and the government minister. Added by Stevie Murray on 11 January 2009.